The Arkansas River has enjoyed a warm and stable September and NOAA forecasts through the third week of October indicate we will mostly enjoy more of the same. This is good news for the fishery as it suggests that post-spawn brown trout will resume fall feeding alongside their rainbow cousins. The dry autumn thus far has brought us low, clear flows of about 300 cfs at Wellsville and 350 cfs at Parkdale, with mid-day water temperatures in Bighorn Sheep Canyon at around 56 degrees. Midge activity in the morning has been strong and there have been good mayfly hatches and nymphal drifts, depending on the skies, from as early as 11 am until 4 pm. Anglers hitting the water later than that should consider streamers or attractor dries along the shoreline. With the brown trout spawn just getting underway, we expect a very active fishery, at least through the month of October. Trout angling at Clear Creek Reservoir from a boat has been good, but fair from the shoreline. A majority of boat and shore anglers caught homogeneous groups of 8 to 12-inch rainbow trout. The best shore fishing has been early in the day, but shore anglers still experienced some success midday too. Shore anglers caught trout on sherbert PowerBait at the boat ramp parking lot area. Woolly buggers have been the most productive fly for fly fishermen. Most boat anglers reported landing at least 10 trout in the morning. Trout went for orange Blue Fox spinners and Rapalas from a boat. Kokanee salmon fishing from a boat remains slow. Normally the best time to land kokanee salmon is at dawn. Kokanee salmon usually go for squids tipped with corn near the dam of the reservoir. Midday water surface temperatures averaged around 54 degrees. Keep in mind that the reservoir is now closed to trailer motorized watercrafts for the rest of 2016. The lake is currently at around 754 surface acres at an elevation of 6186 feet. The surface temperature has been sitting around 60 degrees. Trout have fishing from the shoreline has really picked up in the last two days. 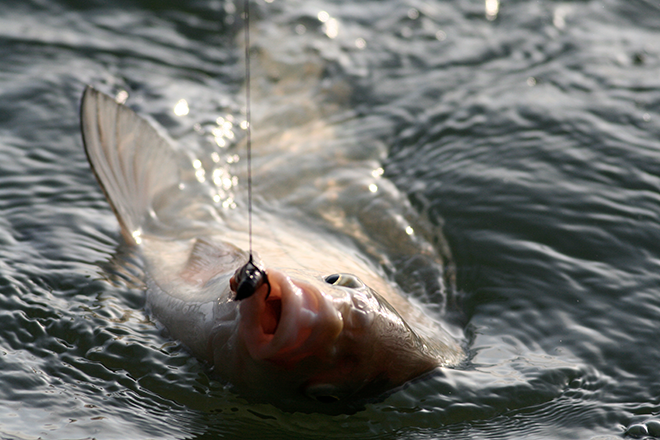 Anglers have had success using night crawlers and artificial flies. Boaters are still catching trout, walleye, and perch using jigs tipped with night crawlers or artificial minnows. Others are having luck trolling with worm harnesses.